Sometimes you rescue a cat, and sometimes that cat rescues you right back. Talk to a few of New York City's Anjellicle Cats Rescue (ACR) volunteers and you will hear amazing tales of cats that have entered the lives of their human adopters and changed them for the better. One such relationship started with a homeless cat named Nina. 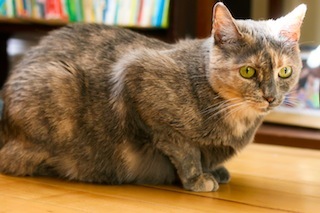 Nina was one of many cats that are rescued at the last minute from New York City's crowded Animal Care and Control who was in danger of being euthanized. 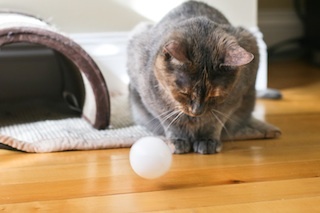 Anjellicle Cats Rescue and a whole host of other non-profit, all-volunteer rescue groups in the New York City area operate under the umbrella of the Mayor's Alliance and frequently pull cats out of the shelter to give them a second chance to find a permanent home. 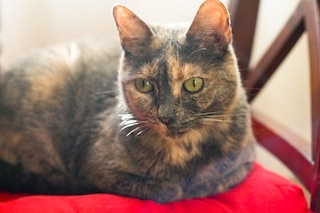 Anjellicle Cats rescued Nina and worked to find her a new home. 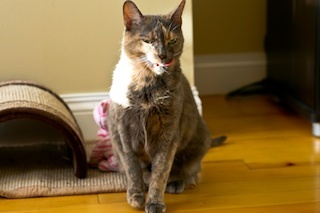 At one point, Nina was adopted, but due to her new owner's circumstances, was returned to ACR. She lived in the "cat room" located in the back of Spoiled Brats, a pet store in Hell's Kitchen. Many of ACR's cats are housed in foster homes until they are adopted, or live in one of three pet stores throughout the city. 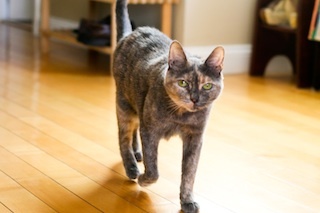 Soon enough, Nina was adopted again and this time, her new adopter, Natacha Diaz, contacted Anjellicle Cats after a few weeks to let them know that Nina had provided them with a heartwarming surprise. Nina had not only found a home, but a purpose. Both of Natacha's older children, Liani, 7, and Ethan, 5, have pervasive developmental disorder and are high-functioning on the autistic spectrum. Before Nina came to their home, the kids had been through many different types of ongoing therapies in order to help them cope with day-to-day changes and activities. "While the therapies have helped them," Natacha said, "I must say that Nina has brought them a sense of calm that my husband and I haven't seen before. She is always by their side when they are going through emotional changes and she brings them a sense of peace as they rub her head and back. Liani even wrote a book in school titled, All About Cats." Natacha explained that Ethan has had serious sensory integration issues, so they were very pleased when it became apparent that petting Nina was good for Ethan, and was really helping him. There's also 2 year-old Mali, who loves Nina just as much as her brother and sister, and two hamsters. "There's a lot going on in the house and Nina has a very calming effect on all of us," Natacha said, and her husband Ramon agreed. "She always takes part in everything we do, from playing with Ethan and his cars, to being alongside Liani as she reads, to following Mali around the house and showering us all with her wonderful kitty kisses," said Natacha. "She has provided us with so much warmth and comfort. We couldn't imagine our days without her. We appreciate what Nina does for our kids." For her part, Nina takes everything in stride, and simply watches over her family with curiosity and calm. She follows the children to their bedroom, goes after the toys they throw and retreats to her favorite chair to nap in the sun. It is the perfect example of the symbiotic relationship between a rescued shelter cat and a loving family. "It really was destiny that Nina came to us," Natacha said. Nina, curled up in the sunlight, seemed to agree completely. You can help an animal in need by adopting, fostering, volunteering, or donating. Find out how at AnimalAllianceNYC.org.